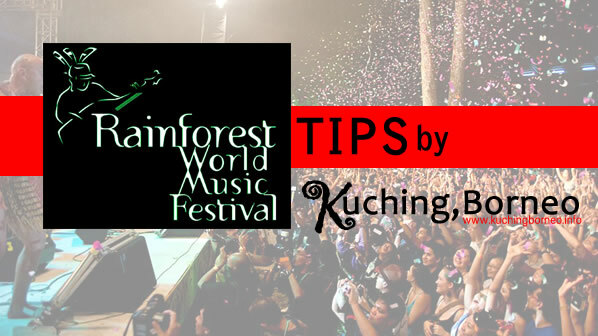 Obtained these tips from the organizers and those whom have been to Malaysia’s most prestigious Rainforest World Music Festival (RWMF) so that you will really enjoy the festival. Dress not to kill, but bring in your decent looking, but ready to be thrown away t-shirt. Once the mud fest starts (if it rains), you’d rather not want to mix that shirt with your other laundry. Ladies, heels need to stay home for this event. Instead, opt for those RM2 flip flops or ‘Selipar Jepun’ we call them in Malaysia. Bring a mat or a foldable chair so that you have a place to sit when you are tired dancing to the beat. Also, book ‘your spot’ at the night concert area, or you’d be left with ‘less appealing’ spots to sit. Bring a plastic bag to store any electronic or vital items. If it rains, at least you are safe. Follow the rules and regulations set by the organizers or the RWMF. No drugs, no sharp objects, no outside food and drinks. Attend the workshops because they are the gem of the festival. The workshops are in fact more amazing than the night concerts. 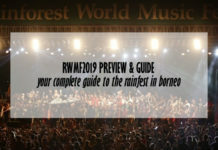 Unless you are selling your RWMF photos (note that you are actually not allowed to do so), let the big DSLRs stay home, and bring along small mobile cameras. Also remember to bring along your spare battery. Bring enough cash. You’d be suprise to what you’d find yourself buying in the festival area. Special made t-shirts come at RM25 at the least (just to give you an idea). Nearest ATM is 3o minutes away by car! Get a tattoo to look uber cool, and feel like you’re in Borneo! Bring a friend because it’s more enjoyable that way. 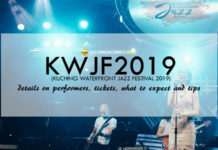 However, do make an effort to say ‘Hi’ to everyone you meet, because past experience tells us that a simple ‘Hi’ can increase your friendlist on Facebook and make the RWMF a must go next year! Be there early. There are usually long queues at the gate for tickets or access to the venue due to ticket verification and other security measures. No food & drink and animals are allowed to be brought inside the venue. Limited car-parking facilities are available near the festival site. However, to avoid any inconvenience, catch the shuttle buses which will operate at regular intervals during the event. Be sure your wristband is on your wrist at all times during the fest. You may be escorted out of the venue if you do not have it on your wrist. Bring extra clothing. You might want to take a quick bath. And by the way, when they say don’t they mean it. They are pretty strict when it comes to security so expect illegal items to be removed from you at the gate of the Sarawak Cultural Village.